We supply and operate a portable laser shooting game called laser tag (similar to laser quest and laser quasar arenas) suitable for many different types of events. If you enjoy excitement and fun, our mobile laser tag arena is just what you have been looking for. 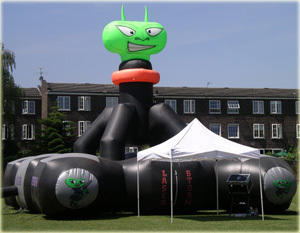 With the choice of an indoor or outdoor inflatable laser tag arenas, there is bound to be a solution for you. Both arenas are run by trained operators for the duration of the event to ensure safe use of the equipment.